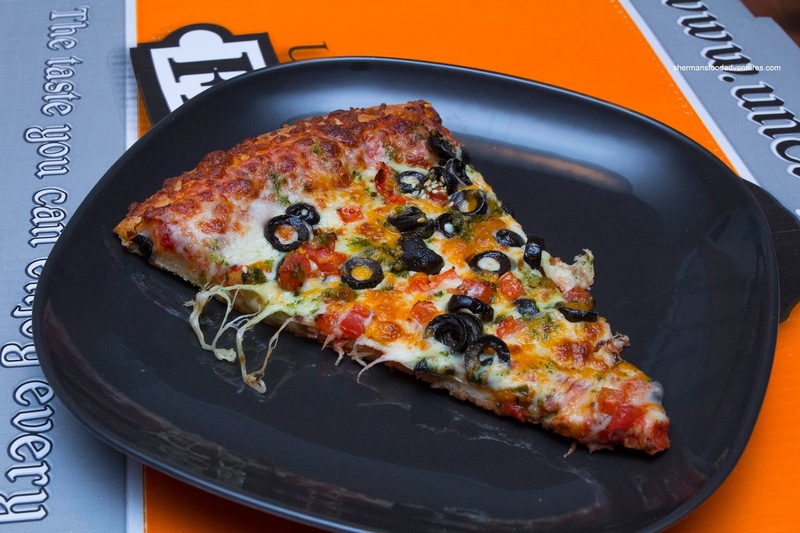 Due to my recent slice pizza crusade, it was only natural that I do a revisit to the one of the best in town. I'm not referring to Fresh Slice or Mega Bite (although they do the job). Rather, it was ol' Uncle Fatih's after late night hockey on a Saturday. Yes, it has been a sad state of affairs since Gordo's concussion - no one to eat with me! 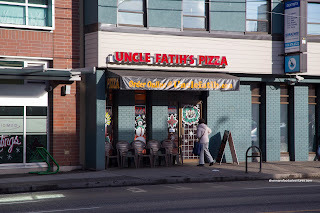 Also, prior to the Neapolitan Pizza explosion in town, I believed that Uncle Fatih's was one of the best in town. Naturally, as I tried more pizzas, my opinion has changed. I ended up picking up an equivalent of a whole extra large pizza (I guess I was hungry?). After a quick warmup in the toaster oven, I gave the Beef & Blue a go and it as pretty much how I remembered it. The crust was light and crispy while the ample amount of beef on top ensured there was enough flavour. In this case, possibly too much as it was on the saltier side. The modest amount of blue cheese dressing lessened its impact. 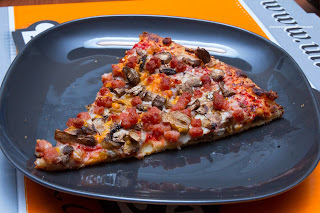 Next I had the Bacon and Mushroom which was loaded with ingredients. 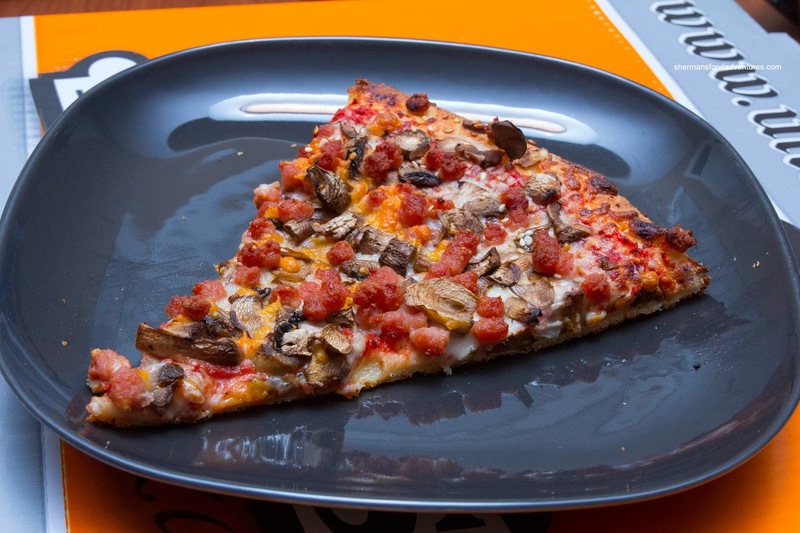 Again, this meant the pizza was salty once again, but the tart tomato sauce (plenty of tomato paste) helped balance it out. Viv tried the Olive, Tomato and Pesto which was flavourful (and salty as well). The plethora of olives was the culprit in this case. Hence, the pesto got lost and we really didn't taste any of it. The little bits of tomato helped water down some of the salt. 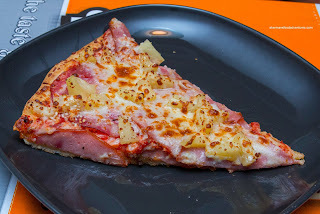 Lastly, I had a slice of the Ham & Pineapple which was literally covered with ham and only a bit of cheese and pineapple. And yes, the pizza was again on the saltier side. And much like other versions of this pizza, the pineapple helped balance the flavours. 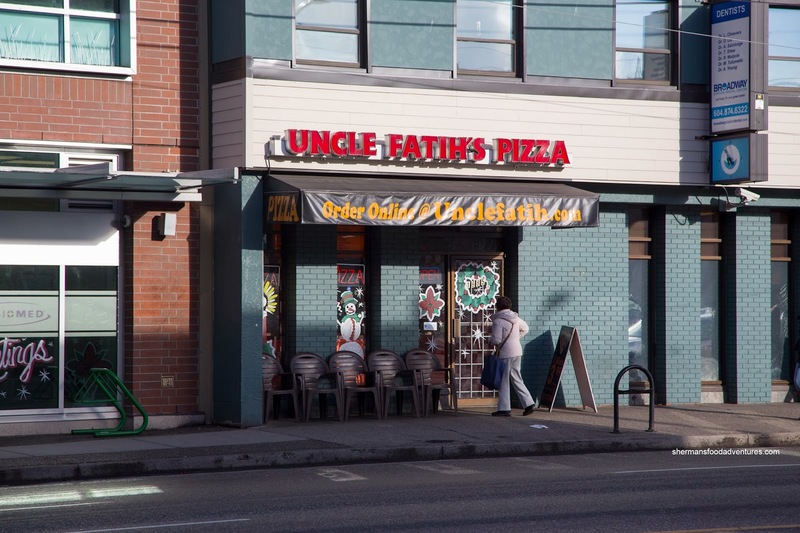 On this revisit, it pretty much confirmed what I thought before - that Uncle Fatih's is one of the better slice pizza joints out there albeit one has to like salt. Oh and on a final note, I chose not to compare this directly with the Neapolitan pizza joints because they are completely different animals. I enjoy UF's at the 8th/Cambie location but parking can be quite challenging. So I try to go there > 8pm. Really for the price, they are the best in town, bar none. But Ragazzi's and Pizza Garden are the true champions even with their slight higher prices. Yes, UF's can be a bit on the saltier side. I do love the sesame crust. I noticed that Lombardo's has entered the by-the-slice market with a separate kiosk opening onto Commercial Drive. 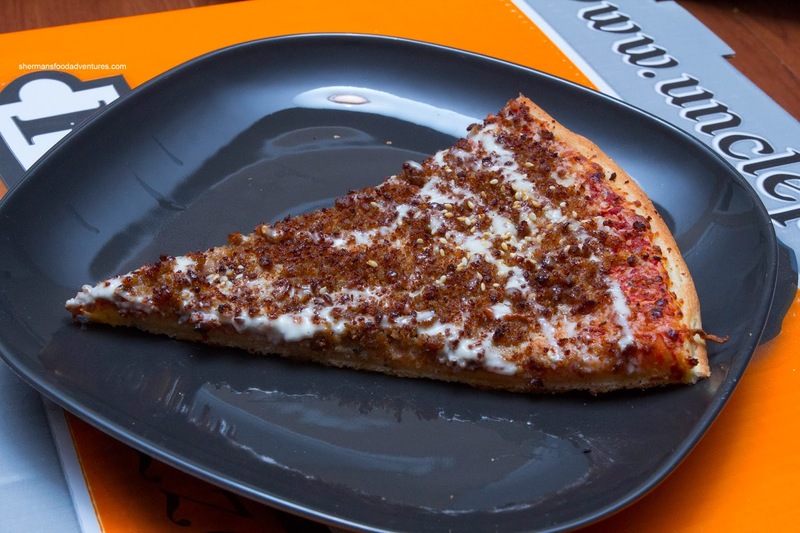 Not exactly a wedge per se, but more like Trilussa's where they will slice off as much as you like from a long slab of pizza, and charge you for it by weight. I like Fatih's pizza except for the sesame seeds, which they put on every pizza before they bake it. Wish they would leave it as an option for the customer sprinkle on after if they like. 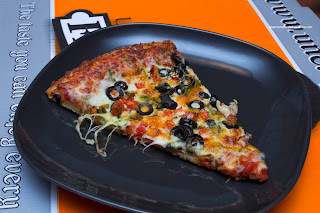 Have to concur with LR, Pizza Garden is my favourite BTS pizza on the drive.